"My story is not really connected. I just made it up in an instant." Can storytelling be inherently democratic? The traditional moviegoing experience suggests that no, it can't—we're passive observers of someone else's work, watching the narrative unfold, not participating in the storytelling. We watch a movie, basically, in the same manner that we read a novel—this is one reason why nobody has yet cracked the nut of entertaining us in nontraditional ways on the Internet. (If you think that Jane Eyre should go see what's in the attic, turn to page 10. If you don't, turn to page 17.) But Mysterious Object at Noon looks to shake up that paradigm. The director, Apichatpong Weerasethakul, took his camera to the smallest villages of his native Thailand, started shooting, and said, basically, to the people he encountered: Help me tell a story. The result isn't always dramatically satisfying and can frequently be downright baffling, but the movie works as well or better on another level, showing us the unadorned lives of many rural Thais. The storyline itself has a shaggy dog quality, as you might expect—it concerns a wheelchair-bound boy, and the sudden disappearance of his tutor. Are the gods at work in making her evaporate? Where has she gone? What does the boy think, and what causes him to be in a wheelchair? The film gets no hard and fast answers to these questions, and after the initial shooting, the crew had some amateur actors play out the scenarios described by the various participants. It's not the dramatic tension that will grab you, but rather the casual views of everyday life—the ordinariness for these people of riding on an elephant, say, or a daughter taking her aging father to the doctor for a hearing aid, or a kids' makeshift game of volleyball with a crushed tin can. In the telling and retelling of the tale, you may start to wonder about its content, but it seems pretty clear that this is just a story to these people, not the retelling of a familiar myth or a contemporary interpretation of a known motif. And so you'll be struck by the ingenuity of the amateur storytellers, be they little kids at school vying for face time with the camera, or the good-natured folks replaying someone else's story, with a man on a bicycle doubling for the boy in the wheelchair. Given the almost arbitrary nature of the filmmaking, there isn't always something yanking you into the next scene, wondering what's going to happen—at times, I thought I had inadvertently pushed the shuffle button on my DVD remote. There's no continued passing of the baton as there is in a movie like Slacker, and I readily admit that my search for a traditional structure here probably has less to do with the movie, and more with being locked into the Western paradigm of a neatly structured beginning, middle and end. The storytelling even stops a good fifteen minutes before the end of the movie, too, and I actually found I liked the coda the best—simple shots of little Thai kids playing soccer, or goofing around with their dog, or going for a swim. It's rare to see so many people lacking self-consciousness in front of the camera for such an extended period of time, and may make you think that the Thais know something that we don't. Image Transfer Review: The film was obviously made on the cheap, but that actually becomes part of its visual style, so the scratches and debris on the print are easily forgiven. What's more unfortunate is that much of the film seems to have been overexposed, so the backgrounds are frequently blown out, and the faces lack the clarity that you'd like in a project of this sort. There are also some resolution problems, and when somebody on camera wears a striped shirt, it tends to shine. Audio Transfer Review: A fair amount of interference on the audio track, which may be a problem for you if you speak Thai; I don't, and was actually pleased to hear a good amount of ambient noise, which lends to the documentary feel of the piece. Extras Review: An interview (08m:18s) with the director sheds some light on the production, which was shot over the course of three years; most of the crew worked on a volunteer basis, and the inspiration for the movie came when Weerasethakul, as a student at the Art Institute of Chicago, saw work by the Surrealists. The subtitles are generally legible, though on occasion the white letters are projected against a white background, making some of them hard to make out. 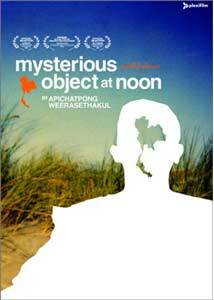 A thought-provoking exercise on the nature of cinematic storytelling, Mysterious Object at Noon works well as a Surrealist-style experiment, but even better as a vérité document of rural Thailand. It's not a rousing crowd pleaser, that's for sure, but if you're looking for something more ambitious and challenging, it's worth checking out.